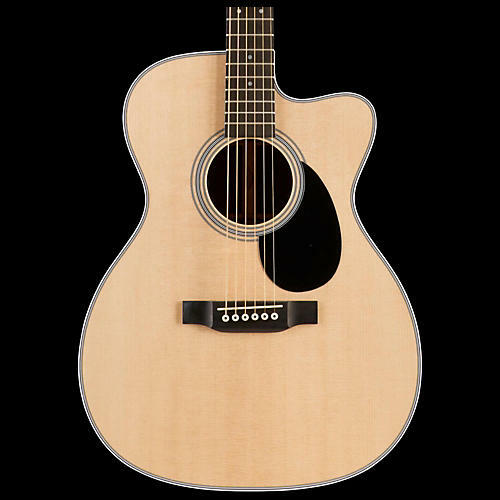 The Martin Standard Series OMC-28E Orchestra Model Acoustic-Electric Guitar blends model-specific sound images using a Martin Gold Plus under-the-saddle transducer to achieve optimum acoustic reproduction. The OM-28 was the first guitar Martin offered with a 14-fret neck. Produced from 1929-1933, the OM-28 is widely considered the original modern flat top steel-string guitar. Differing only in body size from the Martin DC-28E, this Standard Series OMC-28E Orchestra Model is equipped with a cutaway and factory installed Aura VT Enhance electronics. Includes hardshell case.